Gas, gas, gas, it is the only way they deal with problems that come under one heading. Police spray tear gas in Taksim Square. Demotix/Sadik Gulec. All rights reserved. 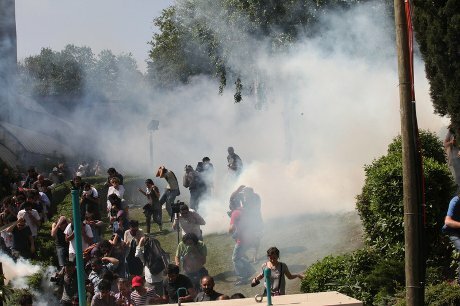 On May 28 an impromptu occupation began in Istanbul’s central Gezi Park following the news that the metropolitan municipality had sent bulldozers to demolish the park. The park was doomed as it sits on the pathway of a new urban restructuring programme which included the transformation of the green zone into another superfluous shopping complex. Largely ignored by the outlets of the corporate press, the news travelled quickly on social media, followed by the appearance of a number of protesters at the scene. Four days since the initial mobilisation, Gezi Park has witnessed a continuous influx of protestors who have organised sit-ins and public talks in a largely carnivalesque atmosphere. On May 30, Al Jazeera reported that ‘unconfirmed reports suggest more than 10,000 people are currently gathered in Taksim’s Gezi Park’. But the increasing number of bodies gathered at the location could not make a dent in the AKP government’s commitment to ‘urban renewal’. On the contrary, the government responded to this unexpected public resistance by repeating a time-honoured act of histrionics in Turkish politics: ignore the public, if that does not work, terrorise them. The decision has been made and we will proceed accordingly. You cannot do anything about it. If you [protestors] are concerned with history that much, go and read the actual history of Gezi Park. We will revive history [and] we are doing this for our people. Police line in front of the Tarlabasi police station, not far from Gezi Park. Demotix/Jodi Hilton. All rights reserved. Besides Erdoğan’s problematic reference to the Ottoman past, the AKP government attempted to shift the terrain of discussion to the relatively ‘safe’ zone of environmental politics. Erdoğan expertly recounted the number of trees the government has planted during his term (2.5 billion apparently) and Forestry and Waterworks Minister Veysel Eroğlu promised that they will plant ‘a hundred times more trees than are cut’ in Gezi Park. The protection of Gezi Park as ‘one of the few remaining green spots in downtown Istanbul’ is essential, but the meteoric rise of the occupation and the subsequent public outrage against the government signifies discontent with a broader trend that underpins the AKP’s reign since 2002: authoritarian neoliberalism. The AKP’s rise to power was partially a result of its successful capitalisation on the failures of the previous coalitions and its entry to the political scene was marked with the explicit promise of pursuing the EU accession process. The determining factor in its political trajectory, however, has been its commitment to a full-blown neoliberal economic policy shaped around privatisations and trade liberalisations. Short-term effects of neoliberalisation have materialised in the decrease of the poverty trend by national standards (constant decrease from 2003 to 2006), fluctuations in the Gini index (2002: 42.7; 2005: 42.6; 2007: 39.3; 2008: 39) and a slight improvement in the country inequality trend. By 2011, Turkey had become the eighteenth largest economy (measured by nominal GDP) after a disastrous financial crisis in 2001. This delusory success story has conjointly reinforced a misplaced faith in free market dogmatism despite the fact that the social indicators of development - such as the number of people living below the national poverty line - took a downturn after 2008. While neoliberal policies have become part and parcel of Turkish economic administration since the 1980s, the AKP amplified the existing drive to an unprecedented extent. The implementation of $380 million of annual privatisation before 2003 has skyrocketed to a staggering $6 billion during Erdoğan’s three terms in office. Almost every remnant of the developmental state - from bridges to the tobacco monopoly (TEKEL), power stations to the state-owned banks - have been privatised or listed for auction. While the sweeping reforms have engendered wide-spread resistance including the long-fought struggles of TEKEL workers and grassroots coalitions against the construction of the Hydroelectric Power Plants (HES), the government has single-mindedly maintained its neoliberal onslaught on services, communities and the environment. This legal framework makes no distinction between an armed PKK combatant and a civilian demonstrator. 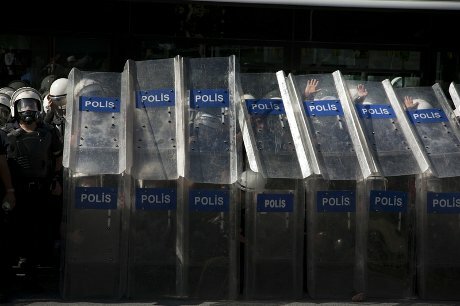 In fact, demonstrators may be punished more harshly, because while combatants who turn themselves in may receive partial amnesty under the ‘Effective Repentance’ provision in the Turkish Penal Code, there is no such provision to reduce the sentences of peaceful demonstrators who have never taken up arms. As a result, peaceful demonstrators with no clear PKK affiliation may be punished more harshly than PKK members who have actually served as guerrilla fighters (Human Rights Watch). Promised constitutional and other legal reforms did not occur. Instead, the right to freedom of expression was threatened and protesters faced increased police violence. Thousands of prosecutions brought under flawed anti-terrorism laws routinely failed fair trial standards (Amnesty International). Simultaneously, privatisation and the closure of public spaces continues as an increasing number of symbolic venues have become targets of the new construction boom. Istanbul’s world-renowned Emek theatre was closed down in a showdown, Karaköy, Tophane and Salıpazarı coastal lines have been restricted to public access as part of a $702 million auction and Erdoğan’s ostentatious ‘crazy project’ Canal Istanbul is destined to engender catastrophic consequences for the city’s already debilitated ecological balance - notwithstanding the projected $350 billion investment market it will create. The planned urban restructuring of Taksim and the destruction of Gezi Park has to be understood in the context of state-driven privatisation projects which fulfill the double enactment of surplus absorption and the closure of public spaces. This is not a mere transplantation of the Occupy Wall Street/LSX into the overstrained anatomy of Turkish politics. The organisational parallels end at the question of confronting state power. The protesters converged at Gezi Park know that the AKP will continue the neoliberalisation of urban and economic space unless it is challenged by a strong, coordinated grassroots mobilisation. The Gezi Park occupation can succeed where the TEKEL resistance faltered in 2010 - by igniting a spark that can generalise the struggle against the AKP’s authoritarian neoliberalism. This article was published as a blog post here on 1 June 2013.